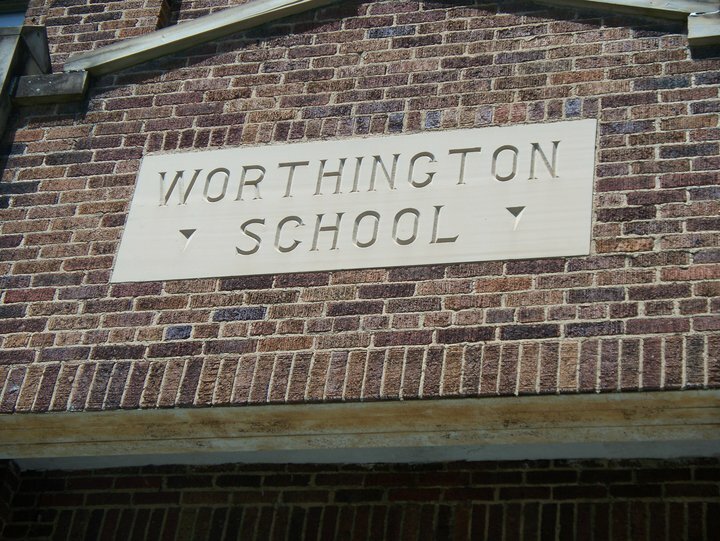 There is something special about the relationship between USS Kentucky (SSBN 737) and Worthington Elementary School in Worthington, Kentucky. It might by that no other boat has adopted a school so far from its homeport. It might be that no other boat has maintained a relationship as long as USS Kentucky has with Worthington Elementary. It might also be, oh, Campbell Elementary in Wurtland. It could also be Raceland-Worthington High School. It could be the Worthington community itself–or Russell, or Wurtland, or Flatwoods, or Ashland. It could be the entire area, for that matter, but one thing is for certain. There is a special bond between this rural community in Northeastern Kentucky, and the anchor is Worthington Elementary. More specifically, it is Mrs. Jo Biehle, 4th grade teacher. Mrs. Jo Biehle underway aboard USS Kentucky, June 2003. Back before the boat commissioned, Biehle, then teaching 3rd grade at Campbell Elementary, read in the newspaper that the Navy was constructing an Ohio-class submarine that would be named for the Bluegrass State. She thought it would be a good thing for her class and her school to get involved, and so she set to work. It was not an easy relationship to establish either. Early on, she was rebuffed. When people involved with the commissioning first heard about this elementary school teacher in an extremely small town in Eastern Kentucky, they just were not inclined to take her seriously. But then the care packages and letters from the students arrived. 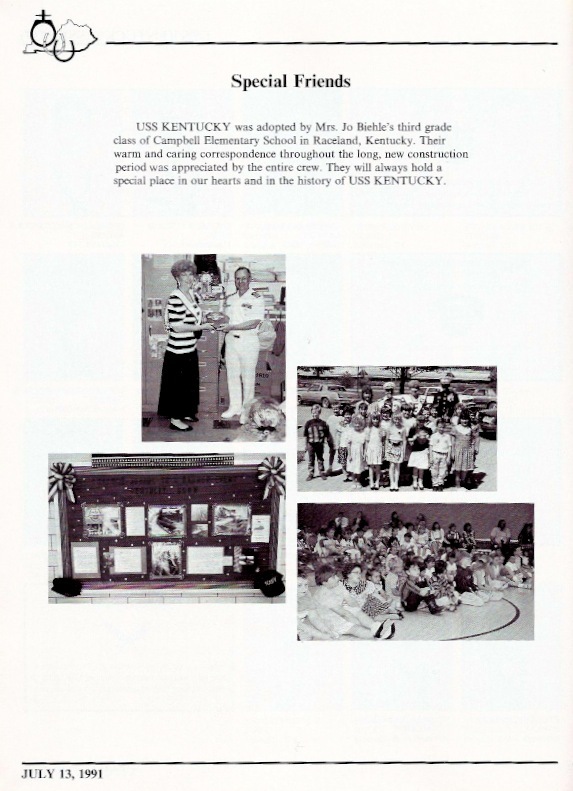 By the time the boat was commissioned, the relationship was so strong that a page of the commissioning brochure was dedicated to Mrs. Biehle’s 3rd grade class at Campbell elementary. 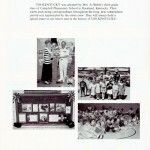 Mrs. Biehle's 4th Grade Class is recognized in USS Kentucky's commissioning book, July 13, 1991. As time has passed, the bond has continued to flourish, following Mrs. Biehle from Campbell to Worthington, and the boat from Kings Bay, Georgia to Bangor, Washington. 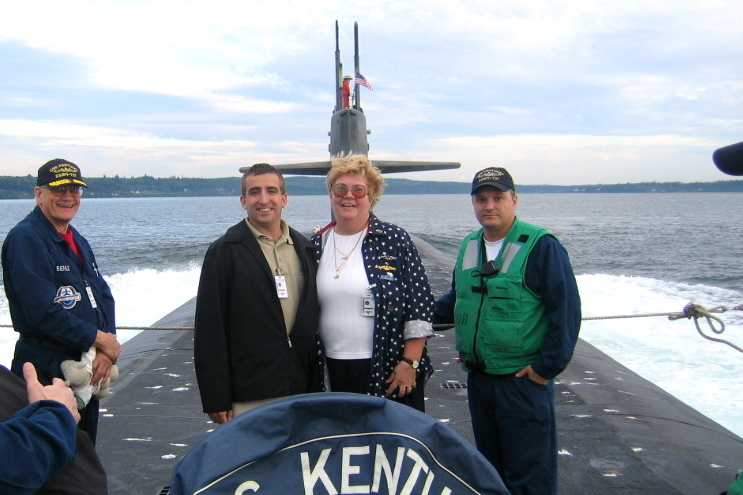 Over the years, both USS Kentucky crews have made repeated trips to Worthington. They built a gazebo and picnic pavilion at the school. They wired the school for Ethernet, and they’ve helped with the flower beds. They read to students and talk to them about life in the Navy and submarine force. To walk into Worthington, is almost like walking into a Navy museum, as photos of Sailors and memorabilia adorn the walls. Families consider it an honor to host visiting submariners in their homes, many forming relationships that stand the test of time. Over the years, the school has sent numerous care packages and letters to the boat, always reminding them they care. And it goes both ways. Worthington students have spent the night on board the boat. Items from the school adorn the passageways and bulkheads of the boat and the off-crew office. The high school band has played at changes of command. And in 2009, when Kentucky reworked her decks, she laid down tiles printed with the mascots of each Kentucky university and the boat’s favorite school–Worthington Elementary. It makes a difference, knowing one another cares. When a Sailor visits Worthington, he becomes a celebrity for a day. Kids and parents alike ask for autographs and pictures. But more importantly, the students know that someone form the Navy, from a submarine, from the USS Kentucky took some time to come see them at their school. Here each learns about the Kentucky Unbridled Spirit.